Craving bacon but don't eat meat? I have not consumed meat for a long time but once in a while, I get a craving for bacon, lettuce and tomato sandwich. The combination of a toasted slice of bread with tomatoes and lettuce just calls my name. I have tried this sandwich without bacon and it is just not the same and I just will eat another type of sandwich rather than eat a dead pig. So when I discovered that people were making vegan bacon out of eggplant, I just had to try it. 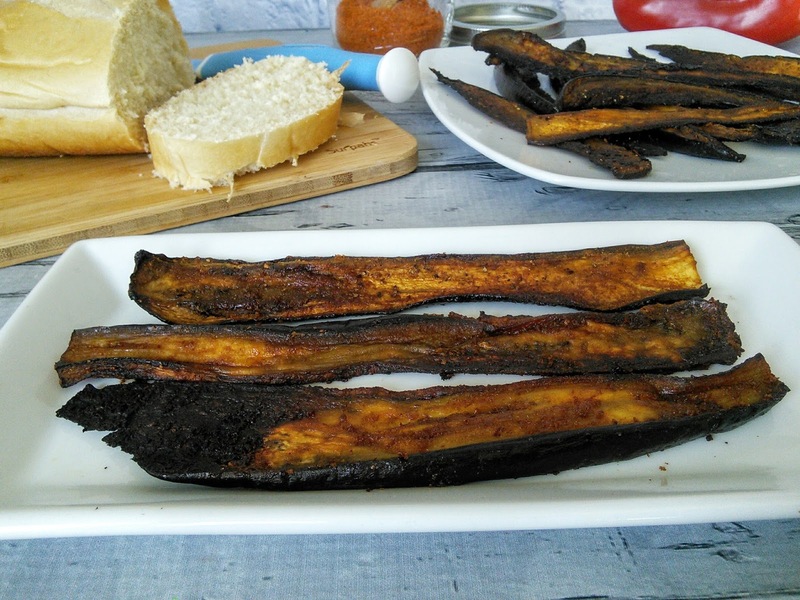 I do enjoy eggplant when it is marinated in soy sauce so being that vegan bacon is made with similar ingredients, I just had to make me some bacon. I found this recipe through many searches and omitted/changed ingredients. The one ingredient that I omitted was liquid smoke as that one just sounded weird to me and I did not want to spend a lot of money for a bottle of smoke. 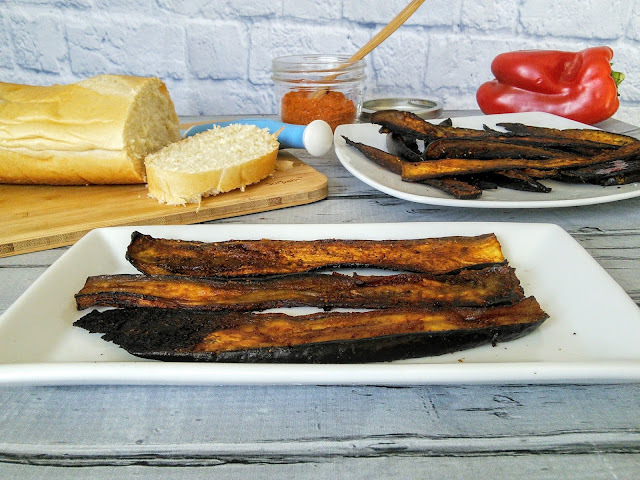 Now if you are a meat eater, this vegan bacon will not be the same as the real stuff but if you want to follow a meatless diet than this is a great substitute for when you are craving a BLT sandwich. I sliced the eggplant in different sizes to see which ones worked best. The thin slices made crispy bacon while the thicker ones made chewy bacon. I suggest trying out different sizes to see which texture you prefer. Preheat oven to 300°. Line 2 baking sheets with parchment paper or silicone baking sheets. In a small bowl, whisk together olive oil, soy sauce, garlic powder, nutritional yeast, maple syrup, and cayenne powder. Place eggplant slices the bowl of sauce and brush both sides with sauce. Season with pepper. If you don't have enough sauce, just make more.